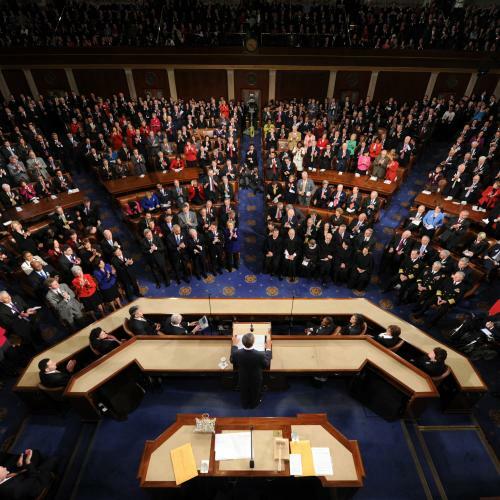 Even with the major distraction of a Republican presidential primary, tonight’s State of the Union speech will be guaranteed to, however briefly, capture the undivided attention of all political junkies. They’re not wrong: The annual tradition does matter. And yet the conventional wisdom about the importance of the speech tends to be almost exactly backwards. You can see the typical press approach in The New York Times preview of the speech earlier this week. The piece is almost entirely focused on Barack Obama’s strategies to win the American public to his side; we’re told that he’s expected to “dra[w] a stark contrast between the parties” and to “define the election” in various ways. The Washington Post says that “how he delivers the argument will test his rhetorical dexterity and set the tone for the year ahead,” and focuses on the speech as a campaign document. So it’s unlikely that the State of the Union can produce any short-term bump in any president’s approval ratings. Even less likely is that the speech could have any effect on voter choice in the upcoming elections, which are still over nine months away. By then, voters won’t remember anything the president says tonight unless he keeps on repeating it all year. And whatever the White House thinks now, there are going to be so many intervening events in the campaign, and in the world in general, that whatever themes seemed appropriate in January could be gone or reduced in importance by Labor Day. But that doesn’t mean we should all just ignore the State of the Union speech. Instead—while you can safely ignore most of the rhetorical flourishes—pay attention to the actual policy proposals and preferences the president mentions. Along with the soon-to-be-released presidential budget proposal, the State of the Union is usually a reliable guide to White House priorities for the next legislative year and even beyond. Students of elections and the presidency have learned that presidents tend to keep their promises, or at least try to, and one way to think about the State of the Union is as a series of promises. Perhaps the most famous one in recent years was George W. Bush’s introduction of the “axis of evil” in the 2002 State of the Union—and with it the fateful pivot from Afghanistan to Iraq. We’re not going to see anything as dramatic this year. But the normal construction of a State of the Union speech involves various outside interests and administration factions fighting to get their priorities mentioned (and as prominently as possible), because they know that it places the president on the path to fighting for those programs. Presidents even wind up searching out new initiatives because they don’t want reporters to conclude that there’s nothing new and that the White House is losing energy; that’s how the Bush administration, for example, wound up supporting a Moon/Mars program. Even when there appears to be little hope of a cooperative Congress, the specific proposals that the president highlights often matter. Sometimes that’s because the president can move forward on those things without Congressional approval; sometimes it’s because once made, a State of the Union proposal tends to stick around. If Obama is re-elected some of the programs orphaned after this year’s speech may show up during his second term. And of course, proposals can be negative as well: a State of the Union veto threat is a lot less likely to be walked back than one that’s made in a less visible way. So feel free to enjoy (or revile) the rhetorical flourishes in Obama’s speech tonight, but pay at least a little attention to the policies he proposes. This is one of those cases where it’s substance, not style, that matters.